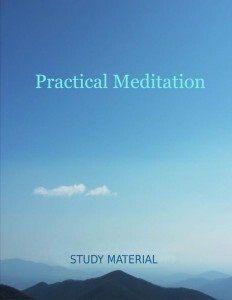 Here are various study and practice resources I have made available. Some are general and others are for specific workshops or retreats I have led. If there is something you are looking for that you can’t find here, please contact me. Vous trouverez ici différentes ressources pour l’étude et la pratique mises à votre disposition. Certaines sont d’ordre général et d’autres pour des ateliers ou des retraites spécifiques que j’ai conduits. S’il y a quelque chose que vous cherchez et que vous ne trouvez pas ici, contactez-moi. Gentleness with yourself is essential in the practice of meditation. Act as if you would take a child by the hand to lead her out of dangerous paths. The experience of peace and clarity can be encouraged through a practice of gentle mind training. Awareness of the content of our thoughts–without suppression of thoughts—can be learned with the practice of calm abiding meditation. A focused mind is a relaxed mind. Focus your attention on your breathing. Breathe naturally. Become present in the moment and place where you are. Just focus the mind on the rising and falling of your shoulders and chest as you inhale and exhale gently. Allow your mind to settle and become calm and present, ready to engage in meditation. The most excellent individual will be able to actually see the Buddha and listen directly to the profound Dharma teachings. He will quickly attain the state of Buddha-hood. The benefits for ordinary people are that in all future lifetimes, they will be born in whatever place the Buddhas are dwelling and become disciples. Because of constantly receiving blessings, their minds will be happy; negative forces will have no effect; and the bad obscurations of karma will be purified. The intellect will be sharpened and awareness increased, and love and compassion will arise. They will have the ability to greatly benefit sentient beings. There are many more benefits of this practice, limitless in number. 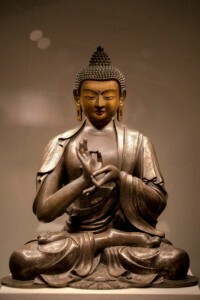 Seeing that the one great need at this time is to supplicate directly the Buddha, Guide of the World, I compiled and translated this text in order to clear up the evils of this troubled time, and in order to increase the good fortune and merit of beings. 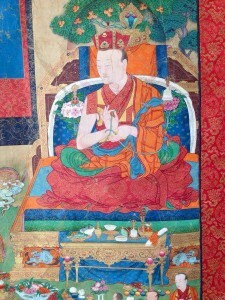 Kunzig Shamar Rinpoche sings the short Muni Mantra. Click to listen to the file. 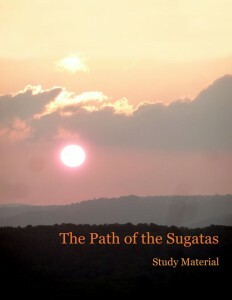 Explanation about The Path of the Sugatas. 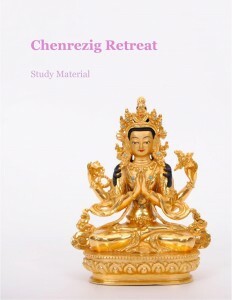 A concise practice of Buddha Shakyamuni with offerings composed in Tibetan and translated by Kunzig Shamar Rinpoche. 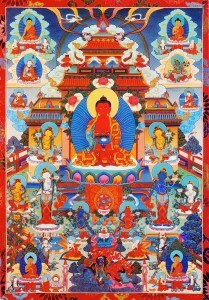 FIRST, the minute you remember this mantra, you gain the benefit of having made offering to all the Buddhas abiding in the ten directions, equaling the number of the atoms of the sand grains of the Pacific Ocean. SECOND, you get the benefit of having prostrated to the holy feet of all those Buddhas. 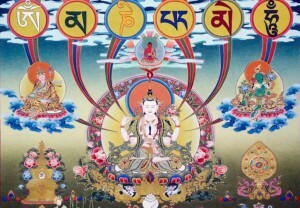 THIRD, you receive the benefit of having made offering of flowers, incense, garlands of flowers, ornaments, ointments, Dharma robes, umbrellas, banners, flags, animals, sitting cloths, divine dress, food, various ornaments and so forth to all the Buddhas abiding in the ten directions (as above). FOURTH, you are freed from all negative karmas. FIFTH, you gain all the merits. 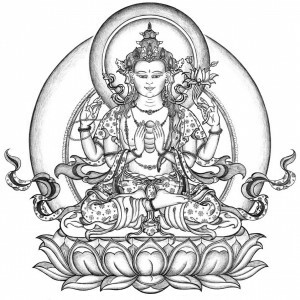 SIXTH, you will see all the Buddhas and Bodhisattvas and they will “give you breath” (Courage of the Bodhisattva). SEVENTH, you will be protected by nagas, devas, nöjin, smell-eaters, asuras, garudas, myemchi, dorje chenpo, Vajrapani the Owner of the Secrecy, and the Four Guardians. They will always follow you perfectly, protect you and guide you. If others try to inflict harm, they will hide you from that. 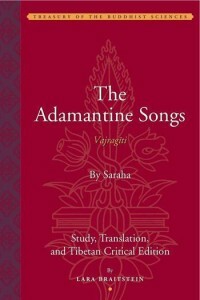 EIGHTH, when you die, your consciousness will transfer from this world to Amitabha Buddha’s pure land, the Blissful Realm. You receive all these qualities and benefits just by remembering this mantra once. 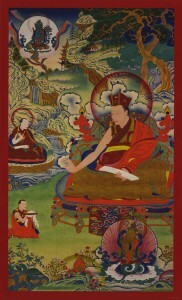 A condensed manual on the meditation-recitation of Noble, Supreme Chenrezig, according to the direct transmission of Tangtong Gyalpo, Powerful Lord of Accomplishments. 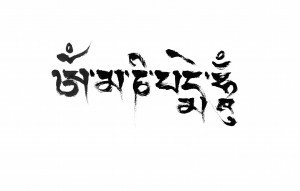 Tibetan text by Thangtong Gyalpo. 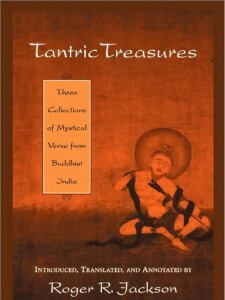 English Translation by Shamar Rinpoche & Pamela Gayle White. 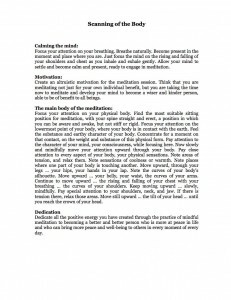 Chenrezig meditation as practiced in the Bodhi Path centers. 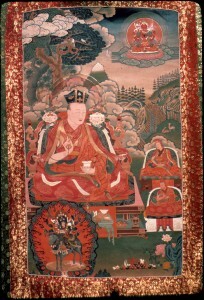 Text by Thangtong Gyalpo. 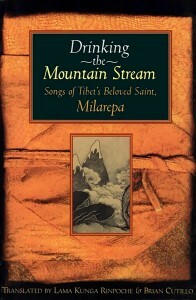 Sung by Karma Trinlay Rinpoche. 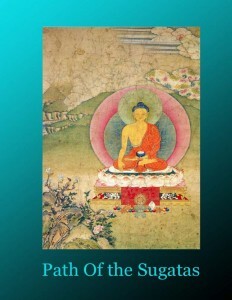 How to Take Rebirth in the Pure Land of Dewachen, the Realm of Great Bliss. If we observe the different beings and the realms in which they are born, we realize that these realms are various. Some are of an impure sort and the beings who appear there, experience suffering. 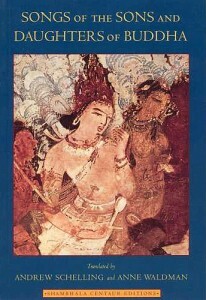 Other realms are mixed; beings are experiencing both suffering and pleasant situations. Finally, there are the blissful realms in which beings enjoy only happiness. 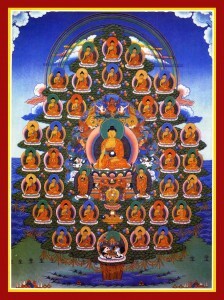 This is an interactive aid to help visualize the arrangement of theThirty-Five Buddhas. It is a Quicktime VR file that allows the user to turn and spin the arrangement to view it from any angle. Simply click and drag on the image once it is fully loaded. It requires the Quicktime plug-in from Apple. Or download it to your computer by right clicking and choosing “Save as…” and open it directly in the Quicktime player. Click to listen to the file. Right-click to download linked file.